I’ve finally begun the Ogham in 3D Mapping Project, (see previous post here). I have been assigned to map the Ogham Stones at Cólaiste Íde/Burnham House. Burnham House, is a detached seven-bay three-storey late-Georgian house, built c. 1800. 1 Originally the estate of Lord Ventry, it is now an Irish speaking girls boarding school, Cólaste Íde. 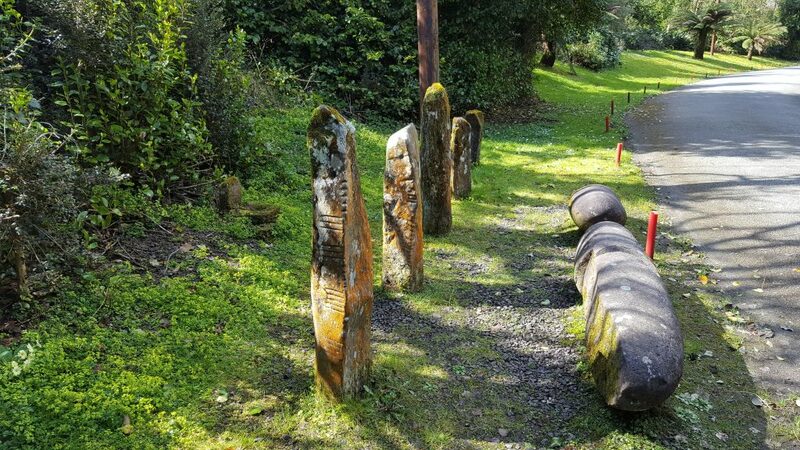 A collection of seven stones, they were though to have originally been situated at a few different sites, eg Ballinrannig; Burnham East, Ballineesteenig, and other sites, but were placed along the driveway by Lord Ventry. I have taken just a few provisional images, to test out the 3D mapping process. What you look for in a photo is very different to what you are looking for in an image to be converted to 3D data. The Burnham Ogham Stones are close together, with a lot of background colour and noise, making the stones harder to photograph. Also, a bright day, with shadows on the stones can affect the finalized dataset. A dull day, with few tones and shadows and less adjustment of the camera, seems to be the optimal for getting good photos to convert. Although for the Ogham in 3D project, we are just gathering the images, I have become very curious about the origins of the Oghams, and in particular the text. If you have been reading previous blog posts I have written, you would know my fascination with text and meaning, text-in-context. Also from a previous conversation with Dr. Orla Murphy of UCC, the nature of Ogham text in particular. That it is a 3D script. It wraps around the stone, rather than just straight on it. I have been thinking about this notion of the 3D text, and could it possibly be read differently if you stop trying to read it 2D like we do with text on paper. It follows on from my thought about skeuomorphic and flat design. We have been reading Ogham text in 2D, and perhaps by 3D mapping the stones, we will discover we have been missing some of the text. It also ties in with my idea for my digital artefact. Playing with the 3D maps and data of the stones, perhaps re-projecting, through projection mapping, the context of the stones. The narrative, and perhaps their original shape. A very interesting project by MediaLab, a team within the Digital Media Department at The Met Museum, involved projection mapping and the Department of Egyptian Art. They created ‘Colour The Temple‘, a tool that uses projected light to digitally restore colour on The Temple of Denur. Through research on early research surveys, pigment palettes, VIL (visible-induced luminescence), they created a presentation that portrayed (through nondestructive means, eg light) the original Egyptian Wall Art in all its glory. I will be talking more about this project in another blog post, not just because the project is of interest, but also about their use of open source software and tools. Kenny, N. 2006. Dingle’s Minard Beach. Archaeology Ireland, 20(4), 16–20.–––– 2008. Materiality and meaning: ogham stone monuments of the Dingle Peninsula. Journal of the Kerry Archaeological and Historical Society (Series 2), 6, 60–88.